FOMC said highly accommodative stance of monetary policy remains appropriate before its first meeting led by Janet Yellen. The Federal Reserve said it will look at a wide range of data in determining when to raise its benchmark interest rate from zero, dropping a pledge tying borrowing costs to a 6.5% unemployment rate. “A highly accommodative stance of monetary policy remains appropriate,” the Federal Open Market Committee said in a statement today following a meeting in Washington that was the first led by Chair Janet Yellen. In determining how long to keep rates low, the committee will assess progress towards its goals of maximum employment and 2% inflation, it said. That assessment takes into account a “wide range of information,” including labor market conditions, inflation expectations and financial markets. The Fed also reduced the monthly pace of bond purchases by $10 billion, to $55 billion. The FOMC repeated that it will reduce asset purchases “in further measured steps at future meetings.” At the same time, “asset purchases are not on a preset course.” The committee announced $10 billion reductions in purchases at the previous two meetings. The central bank’s preferred gauge of consumer prices climbed 1.2% in the year through January and hasn’t exceeded its 2% goal since March 2012. That gives policy makers “ample scope to continue to try to promote a return to full employment,” Yellen testified to lawmakers Feb. 27. Seventy-six percent of economists in a Bloomberg survey March 14-17 predicted the Fed would drop its unemployment threshold. Economists also predicted a $10 billion reduction in the monthly pace of bond purchases, according to the median of responses. 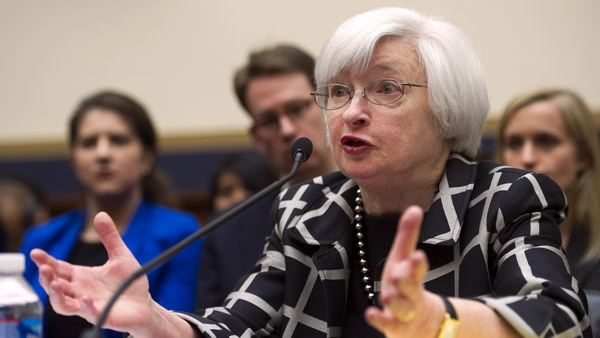 Yellen, 67, took over as Fed chair last month after three years as deputy to Ben S. Bernanke. In that role, she helped shape the communications policies the Fed wielded as it sought to nurture a recovery from the worst recession since the Great Depression. After cutting interest rates to zero in 2008, the Fed embarked on large-scale asset purchases as well as forward guidance intended to convince investors that borrowing costs would stay low for a long time. Starting in December 2012, the FOMC said the federal funds rate would stay low at least as long as unemployment was higher than 6.5% and the outlook for inflation didn’t exceed 2.5%. With the jobless rate at 6.7% last month, that guidance was fast becoming obsolete. “It’s a relic of days of yore,” Brian Jacobsen, who helps oversee $241 billion as chief portfolio strategist at Wells Fargo Advantage Funds in Menomonee Falls, Wisconsin, said before the FOMC statement. Policy makers met this week as economic reports indicated the world’s largest economy is pulling out of a slowdown linked to unusually harsh winter weather. Factory production rose in February by the most in six months as assembly lines churned out more cars, business equipment and chemicals, a month after snowstorms hampered deliveries of parts and materials. Employers last month added more workers than projected following the weakest two-month hiring gain in more than a year. The jobless rate rose from 6.6%, a five-year low, as more people entered the workforce. Retail sales climbed in February for the first time in three months, claims for unemployment benefits declined and consumer confidence improved, reports showed last week. Consumers are getting a boost from stock-market gains fueled by the Fed’s unprecedented stimulus. The Standard & Poor’s 500 Index rose yesterday to 1,872.25, near the 1,878.04 record March 7. The S&P jumped 30% last year for the best advance since 1997. As the economy improves, the Fed is slowly scaling back the large-scale bond purchases that have expanded its balance sheet to a record $4.18 trillion. The purchases have prompted concern among some policy makes that the Fed is fueling asset-price bubbles. The Fed on Dec. 18 announced its first reduction in bond purchases, to $75 billion from $85 billion, then followed up with an equal cut in January to $65 billion. The gorilla of all annuity gorillas has $2.8 trillion in fixed-income assets, and 178 million customers.